Malika Stepasiuk submitted this photo and caption. This is a photo of the East Coast Jazz "Class of 2007" during the "age-out" ceremony at the DCI World Championships in Padadena, Calif. 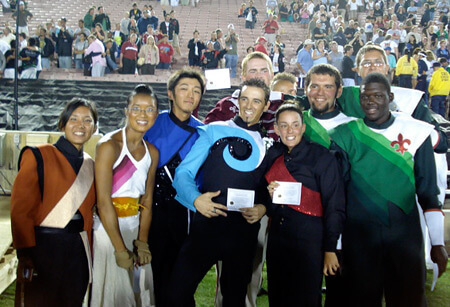 Although East Coast Jazz was inactive for the 2007 season, we were well represented throughout all the divisions of DCI, representing six different corps in six different states, and even one from Japan! tuba) and Miuki (Blue Stars, mellophone). It was great to be able to reunite with "family" members from all over the world for one last time. Although some of us had been removed for several years, we never forgot our seasons with the Jazz.